It’s Taco Tuesday!! 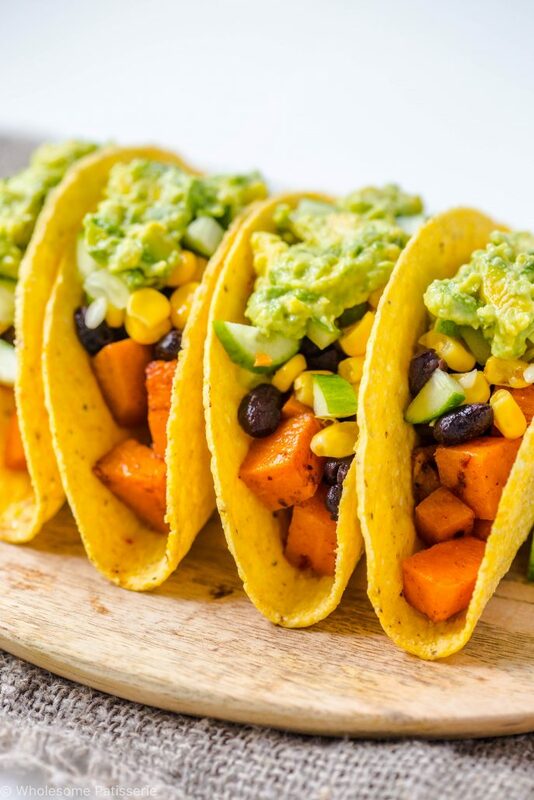 Are you ready for these Spicy Sweet Potato + Black Bean Tacos? I must admit, I have never purposely had tacos on a Tuesday because it’s taco day on Tuesday’s but I am today! Well technically, I ate these bad boys last night but that doesn’t mean you can’t enjoy these tacos today! It’s Tuesday after all! 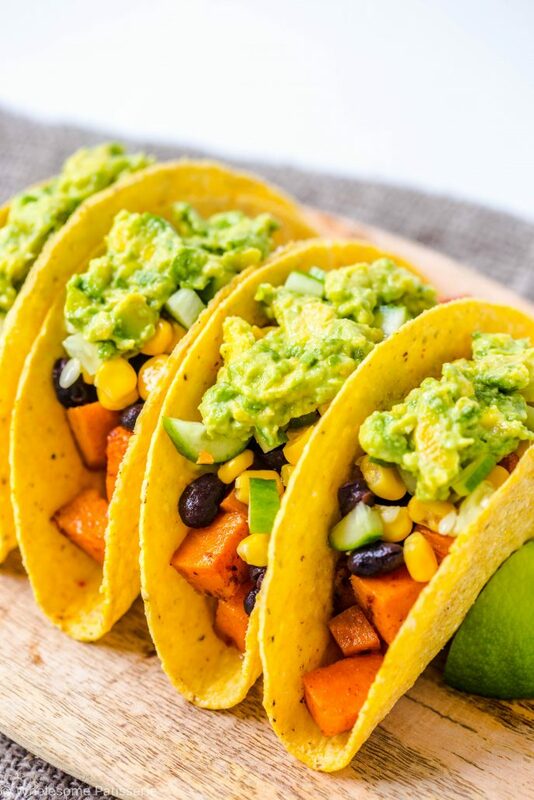 These tacos are super simple to prepare! 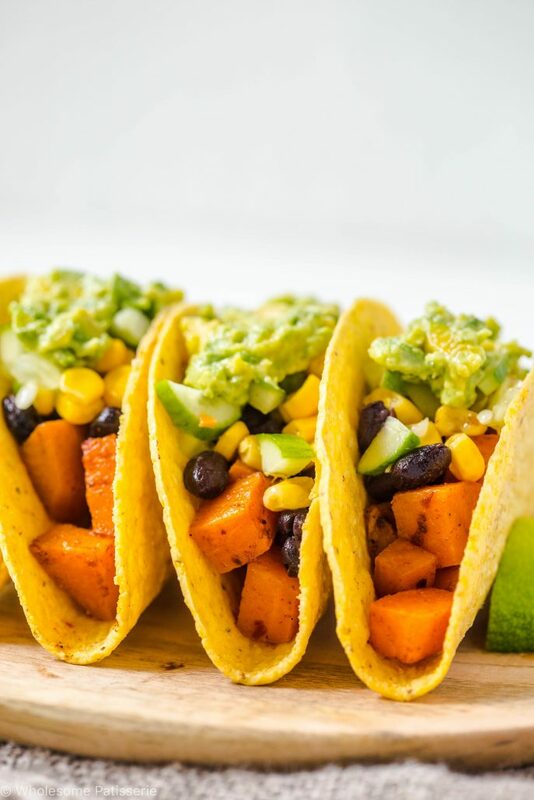 You just roast the spicy cubed sweet potato and chop up a few ingredients for your toppings and that’s pretty much it. I love easy dinners and I bet you do too! Now if you love spice, then you can add your desired amount of chilli flakes onto your roasted sweet potatoes. They are also cooked in ground paprika but I don’t find that no where near as spicy as chilli flakes, that one is pretty obvious isn’t it?! That is why I have added some refreshing toppings such as diced cucumber, sweet juicy corn kernels and the best avocado sauce ever! I’ll let you in on a little secret, if you still find this avocado dressing too involved for a busy weeknight dinner, you can just simply smash some avocado up with a little mayonnaise! I have to let you know though, this avocado dressing is still so easy to make, all done in the one blender and it’s my favourite dressing/sauce of all time! YASS! On another note, have you guys watched ’13 Reasons Why’ yet? I just finished watching it last night and oh my goodness, that was intense. The entire show. I’m crossing my fingers for a second season but I heard there isn’t even a second book?? Anyways, it was a real eye opener, I’m still having after effects! With Easter officially being over, this is my first savoury recipe on here in over a week or is it 2 weeks? I can’t keep up! I miss sharing my savoury recipes with you all. 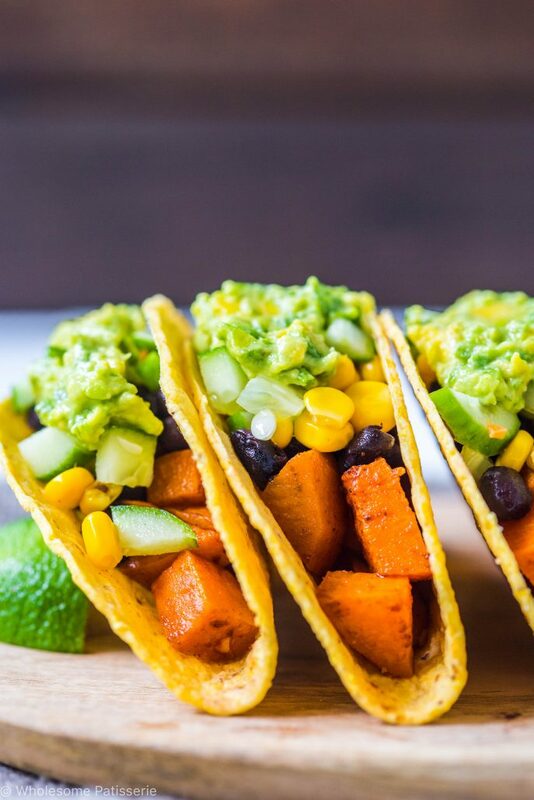 So I thought to kick start it off all again I would share these morish sweet potato and black bean tacos! Enjoy friends! Preheat oven to 200°C (390°F). Place cubed sweet potatoes in a bowl and drizzle over melted coconut oil. Stir through paprika and chilli flakes, adding more chilli if desired. Mix potato until well coated. Pour potato into a baking pan or tray, spreading out into one layer. Place in oven and roast for 20-30 minutes or until tender and golden. Whilst the potatoes are roasting, make your dressing. Add all dressing ingredients into a blender, blend on high until well combined and smooth. Add a little more water if it’s too thick. Pour dressing into a clean bowl and refrigerate. When your potatoes are nearly ready, heat up your taco shells according to packet instructions. 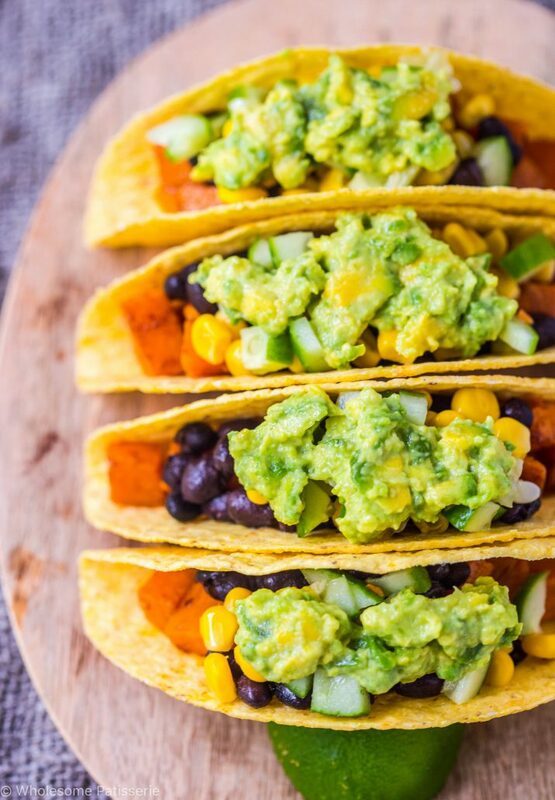 Fill taco shells up with sweet potato and top with black beans, corn kernels, diced cucumber and avocado dressing. Store any leftovers in an airtight container, refrigerated, for 3-4 days. *I use gluten free hard taco shells which I found at my local health food store. You’re welcome to add any additional toppings which you like to enjoy with your tacos. I use mission gf flour tortilla. The are quite taste. I would probably top these with some Greek yogurt to up the protein count. Roasted butternut squash would be even better than sweet potatoes-alot less carbs, and more fiber. They taste just like sweet potatoes when roasted. Take diced squash and sprinkle with olive oil and sage to taste, roast in 450 degree oven for 30 minutes.